A few weeks ago, I went to the amazing Auburn Cord Duesenberg Automobile Museum in Indiana, where I learned about an axle that has not just one gear ratio like in pretty much all modern cars, but two. Here’s how this fascinating contraption works. Nowadays, we’re seeing transmissions with eight, nine and 10 gears as automakers strive to make advancements in acceleration performance and fuel economy. But back in the 1930s, before these wild transmission ever came onto the scene, and even before the highway-oriented “overdrive” caught on, Indiana-based car company Auburn used a different method to get the most out of its engines: a dual-ratio differential. The dual-ratio differential is exactly what its name suggests: the rear differential provides two different gear ratios: a shorter one for maximum tractive force for faster acceleration or steep grade-climbing capability, and a taller one for quiet, fast highway cruising (the Columbia two-speed axle was said to be able to drop the Ford V8's 55 mph cruising RPM from 2,713 to 1,940). While there were different axle ratio options depending upon the engine, on average, the museum exhibit says, the low ratio was about 4.80:1, and the taller ratio was 3.20:1. For comparison, that’s a bigger spread than is available on a Jeep Wrangler JK’s differential gears, which go from the fuel economy-oriented 3.21:1 rear axle ratio on lower trims to the torquey rock crawling-oriented 4.10:1 ratio on the Rubicon. A normal car’s axle ratio is set by simply the quotient between the number of teeth in the ring gear (which ultimately spins at the same rate as the wheels when a car is traveling on a dry surface in a straight line) and the number of teeth found on the pinion gear (which is spun by the driveshaft coming from the transmission or transfer case). 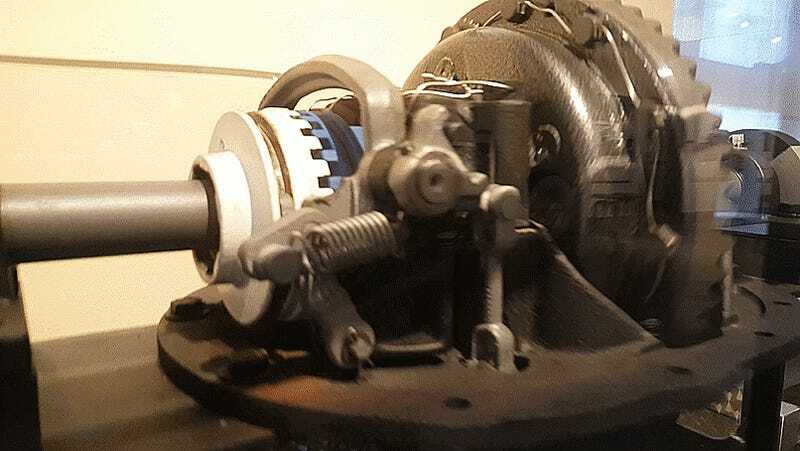 But in the Auburn’s Columbia dual-ratio differential, there’s actually a planetary gear set built into a housing around the differential (you can see the housing in the instagram video above); that planetary gear set’s sun gear or “sliding clutch gear” can be locked or unlocked, ultimately changing the rear axle ratio. [The Auburn Dual-Ratio rear axle] consists of a planetary reduction gear built in a housing around the differential assembly ([the] ring gear [is] mounted on this housing so that it transmits drive from the engine to planetary pinions which are likewise mounted on it). Internal gear is integral with differential housing and sun gear is mounted on a sleeve which is free to revolve on the axle shaft within the dual-ratio housing. Here’s the full-page explainer showing all the components in an Auburn two-speed axle. Notice how the pinion gear (labeled “A”) spins the ring gear (labeled “B”), which rotates the case (labeled “C” and “D”), which then turns the planet gears via their pins (labeled “L”). The differential case itself (labeled “M,” which includes the spider gears that turn the axles) gets spun by the planetary gear set’s ring gear (labeled “K”). So in other words, the driver’s switch—mounted to the steering wheel or dashboard—simply sends vacuum to one side of that cylinder mounted on the front of the axle, which ultimately slides a sleeve so as to either lock the planetary gear set’s sun gear with the axle’s “bearing pedestal” (which is part of the axle housing itself—in other words, this stops the sun gear completely) or to lock the sun gear with the rotation of the “dual ratio housing” in which it sits (“C” and “D” in the image above). Normal operation of the overdrive unit involves getting the car up to speed in 3rd gear, then depressing the clutch pedal and pulling on the overdrive cable. After hearing a solid clunk (telling you the overdrive’s been activated), you release the clutch and you’re in overdrive. The second speed reduced the axles’ original ratio, resulting in a 30% reduction in engine rpm. Although intended for highway speeds, you could engage the overdrive in 1st or 2nd as well; it actually worked in any forward gear. And of course, there’s a special two-speed gearbox adapter for the speedometer that takes adjusts the speedo cable’s output to the gauges to make sure the reading is accurate whether in the high or low rear axle gear. Dual-ratio differentials like the Auburn’s have since died off in the auto industry, presumably because of their clunkiness and because of transmissions that can accomplish the same job (it’s worth noting that the current Jeep Cherokee KL technically does have a “two-speed” rear drive-module, though it works markedly differently and is used for low-speed crawling). That said, it’s not uncommon to find such vacuum-controlled two-speed axles on older work-trucks. The video above depicts a gentleman showing off how he operates the two-speed differential on his old Chevy. Sure, the two-speed axle has fallen out of favor in passenger cars, though that doesn’t mean it’s not fascinating. I’ll be keeping my eye out at the junkyard to find one, if only just to tear it apart.